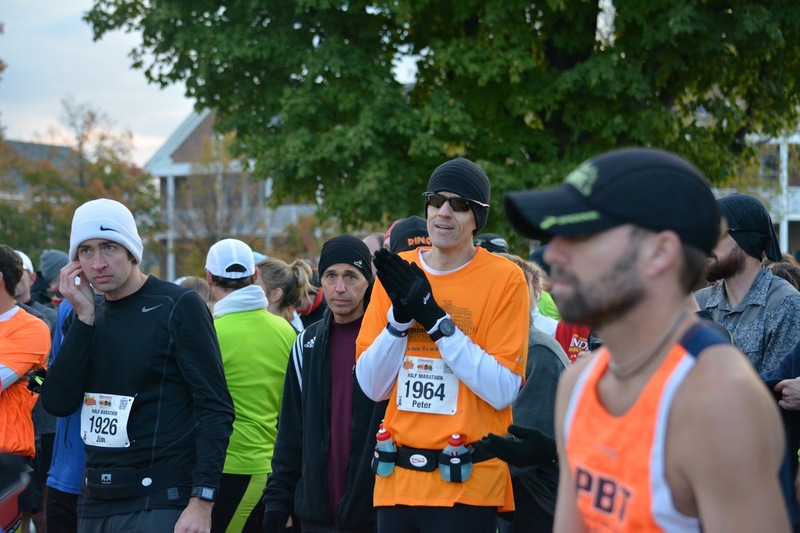 Last Saturday, 10/17/2015, I ran the Indianapolis Marathon as a training run in my build to the Indianapolis Monumental Marathon. 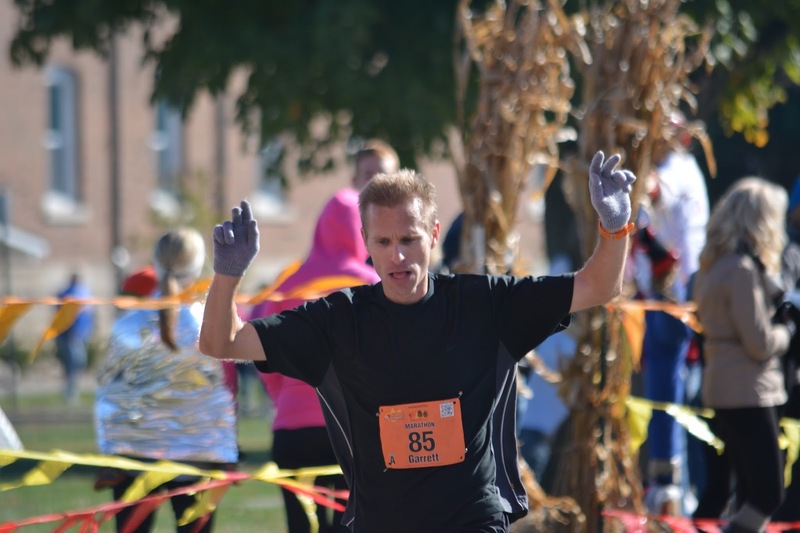 I have run the half marathon at this race for the last several years and have used it as a tune-up race and final fitness gauge for what has always been my "A" marathon, the Monumental. This year, the calendar proved a little challenging. This race is usually at the end of my first week of taper. So, I can use it to gauge where I truly am and I am rested enough to run a PR effort which usually results in an actual PR. The way it worked out this year though it was at the end of my biggest block of training both in quality and quantity. Leaving it a full 3 Saturday's out from the Monumental. I have come to rely on my wife as a manager/coach and when I pointed this out to her she had a solution as usual. She suggested I run the full marathon as a final strength workout and find a half-marathon the next week to run as a tune-up race. 21 days is plenty long enough for me to recover from a marathon run below full race effort and a half-marathon the next week would still allow me to get the feedback I am looking for regarding fitness and race readiness. Bonus, I've never ran the full here before and this is the 20th and final running of the full. From here on out it will only be a half and 5k. My plan was to go out and run somewhere around 3:10 to 3:15. Garrett, you remember him from my other race reports I'm sure, and I had emailed a few times so I knew he was planning on running and looked forward as usual to meeting up with him. I also knew there was a good chance he was going to run this as a full out race and we probably wouldn't be running together. I was a little bummed about it but I also knew that Garrett's PR showed he had the potential to win the thing so I encouraged him to go for it. Race morning we left the hotel a little later than we should have. Traffic was backed up in the parking areas so I jumped out of the car to head to the start area while Mary and Hannah parked. I arrived with about 1/2 hour to spare and found Garrett sitting beneath a tree all zen like. The man has no fear of the marathon, I'm sure of it. Always calm, cool, and collected before the race. We spent a few minutes catching up on each others running over the summer. He's had a good summer and I have no doubt he will have a good race. I see some other friends and exchange "good lucks" and head to the corral. As I said, I'm planning a nice steady strength effort today so I'm not real nervous, I just know I've got a nice long run in front of me. 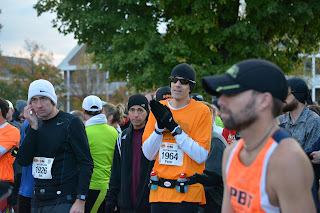 It's probably the coldest morning of the season so far and I keep on my long sleeve tee shirt to start the race. As usual at this race we start right on time. I'm out and the environment has me a little to fast, around 6:50/mile. I figure I'll settle into a slower pace over the next couple of miles and don't worry to much about it. I strike up a conversation with a guy in the first mile. His name is Blake and He says he's under trained but hoping to be able to pull out the full distance today. I tell him my plans and we kind of agree to run together. Mile 1 -- 6:46. My watch auto laps and I realize that I didn't shut the auto-lap off. 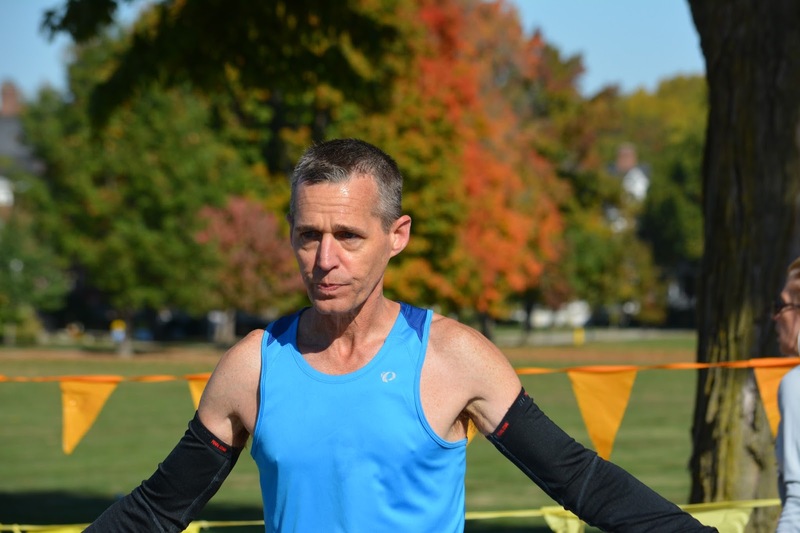 I usually do manual laps in a marathon because the Garmin gets ahead of the mile markers and that will wear on you late in the race. Too late now though. The pace is way faster than planned but I was sure it was just the energy of the start and then loosing track of pace while settling in to running with someone else. I always loose track of pace when I've got company on a run. I tell myself to slow it down some. Miles 2 - 3 -- (6:49, 7:08) are the first pass through Ft. Harrison State Park. The first significant hill in the race is during mile 3. So, I hadn't really got control of the pace like it looks like I might have. The effort is still harder than planned. So I'm still kind of trying to find my groove. I am starting to warm up and thinking about when I can ditch the long sleeve shirt. Mile 4-7 -- (6:58, 6:51, 6:53) I ditch the long sleeve shirt at mile 4 at an aid station and see my wife, for the first time, just a minute later. I see a couple more spectators I know from CKRR here as well. This is a good stretch of the race and goes by pretty quick. Back on the main road through Lawrence, 56th street, a couple of turns and on to the first turn around. Here you get to check out the competition. I didn't see Garrett so I'm guessing he's doing well and hoping I'll get an update later in the race. The pace is still faster than planned but I'm feeling pretty good so I decide to make peace with it and quit chiding myself for running too hard. Miles 8-11 (6:54, 6:50,6:50,7:08) Back in Ft Harrison State Park. About mile 9 or so another runner joins for a minute and and then throws out a "I think I'll actually run a little faster" and starts to pull away. Instinctively, I want to show this guy what I've got and make him sorry he challenged me but I tell Blake that I've got to keep myself in check. I'm not running a PR today so any harder of an effort will only server to sabotage my goal at the Monumental. There are several aid station through here and the running is pretty easy until mile 10.5 which offers the toughest hill in the race and that's reflected in the pace of 7:08. Once you crest the hill its just another couple of minutes until you are back out of the park and heading for the half/full split at mile 12. Miles 12 and 13 (6:42, 6:37) I'm keeping an eye on the guy from mile 9 and even though I know better my pace quickens and I'm keeping him in sight and not letting the gap get too big. I just didn't realize it at the time. I see Hannah finishing off her mileage for the day and ask how she did in the 5k. She lets me know 25:30ish. That was pretty solid coming off an xc PR just about 12 hours ago. I also see my wife and toss her my sock hat as I am getting pretty comfortable with the temperature. We split from the half-marathon here and head back into Ft Harrison State Park. I'll be honest I half expected to loose Blake here but he's a trooper and by heading into the park and not off to the half split he commits to the full distance. It's an out and back from here and the thing about an out and back is once you're out you've got to get back, so you might as well run. Miles 14-17 -- (6:37, 6:39, 6:41) The path gets pretty narrow and I'm glad we are out in front. I wouldn't want to run here in a large pack. Somewhere in here we find out we are 14th and 15th in the full. I'm still keeping the guy from mile 9 in my sights and it shows in the pace. About right around mile 17 the gap completely closes and my instinct is to drop him. I get right beside him and chide him that it's no time to start to fade, we are almost done. As the words come out of my mouth I realize that I am racing this guy. I have a little talk with myself about how this isn't the goal race and all I came for was the distance. I back off and let him go as he seems to get a boost from my little pep talk. I'd love to see his splits because I think he took my advice and dug in. Miles 18 -20 -- (6:47, 6:49, 6:51) Letting the adrenaline go and bringing the pace back down. I'm not racing today, I'm not! I see Garrett he's coming back from the turn around he's probably a mile and a half ahead of me and is running in second place. He looks strong and I yell some encouragement his way and tell him his position. I'm psyc'ed for him. Blake is starting to really struggle at this point. His face is as red as can be and he sounds pretty miserable. I ask him how his last 20 mile run went and he says he had to walk a good portion of it. I think to myself, this guy is a beast. He hasn't made it through a 20 mile run in a good long while but he's keeping up with me an I'm running a pretty strong pace. Probably what a lot of coaches would call a steady state pace. Miles 21, 22, 23 (7:06, 7:12, 7:20) Blake is starting to come undone and I try to slow the pace and help him survive. I'm trying to talk to him and get him out of the dark place I know he has to be in in his head. He refuses to stop or walk and again I see just raw determination. It's one thing to go out and run a good marathon when you've trained for it. But it is impressive to see someone soldier through a marathon they aren't trained for. I have admiration for both. The training it takes to run a strong marathon shows grit and determination and single mindedness that a person commits to for a long period of time. Running a marathon untrained or severely under-trained shows a quality of tough mindedness that is really beyond compare. About mile 22 someone tells us we are fighting for 10th. By mile 23 I'm running in front of him and keeping an eye trying to not drop him. But he is unraveling quickly. Miles 24 -- 7:36 At some point in mile 24 I look back and Blake is no longer in sight. I spend the rest of the mile trying to let him catch up but to no avail. All-in-all it was a great day. Great weather, a good solid long run, my marathon friend Garrett took 2nd overall and I made a new running friend and even under-trained he ran the full distance without stopping or walking. Looking over the data for the race I am very excited by the dang near perfect even split that I ran (1:30:37 for the first half and 1:30:57 for the second half) For a race where you aren't planning to PR I'm not sure you could ask for much more. Garrett taking 2nd place. Good job Garrett!